_ _ When you’ve been “going steady” with someone for awhile, most people can look back on the courtship with fondness– you remember butterflies, romance and getting to know someone new and exciting. But sometimes things just go so very, very wrong. My first date with Nick was on a hot Boston summer night, he drove down to meet me from Connecticut and because we had agreed to be casual, he showed up in cut-off camo Army pants and a Celtics jersey. Hilarious… And then he called me the wrong name. Not quite as hilarious. We had a lovely dinner at a local sushi restaurant, where I proceeded to blurt out completely inappropriate things because my nerves had apparently erased my inner-sensor. Had the date ended there I don’t think we ever would have seen each other again, but thankfully we also decided to catch a movie! As we trekked down the steep sidewalks of Mission Hill towards the train to the theater, my sandal broke and simultaneously the skies opened and began pouring rain… I wish I was kidding. I took a gamble and decided to board the train sporting one shoe– I figured I’d either end up with a second date because I showed I could roll with the punches… or with him thinking I was a disgusting human being. I got both. _ _ Nearly three years later, we’re still together. Sometimes things that you wouldn’t expect to work, make the best combinations; that’s the lesson I learned from my relationship as well as these burgers. Did I essentially just compare my boyfriend to a beef patty? Yes. *Note: The burgers will be fairly juicy on their own, but for the cranberry-brie burgers if you want an extra sauce, you can also make a balsamic vinegar reduction the day before. 1. THE DAY BEFORE: In a tall glass or bowl, add the dried cranberries and pour the orange juice over them. I used about a cup, but you only need enough juice to just cover the top of the berries. Allow them to soak overnight and basically rehydrate by getting infused with the juice. Also use this time to make the balsamic reduction if you want it! 2. THE DAY OF: Heat two tablespoons of olive oil in a sauce pan and add the red onion, cooking them down until they get tender. Drain the cranberries and add them to the onions in the pan and allow to cook for a couple more minutes, stirring and allowing the flavors to meld. Set the berries aside. 4. In a 9×13″ glass baking pan, evenly sprinkle the onion flakes over the bottom and press the ground chuck evenly over the top. Bake in the preheated oven for about 20-22 minutes. The meat will have shrunk up and a fair amount of grease will have accumulated on top (this will have also helped rehydrate the onions on bottom and made them delicious!) so just take a paper towel and blot it off. 5. On one end of the pan, lay the 4 cheddar slices in a square. 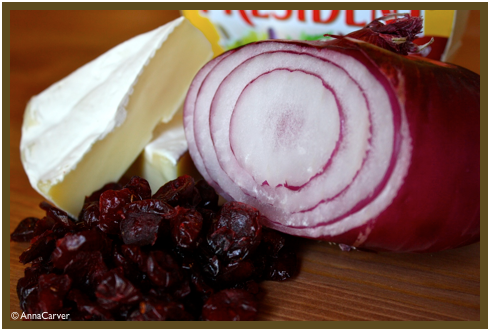 On the other end of the pan, spread a layer of the onion-cranberry mixture and top with slices of brie. This layout will give you 16 sliders with cheddar and 8 with the brie. You can adjust this if you want more of one or the other. 6. Put the burger pan back in the oven for another 2-3 minutes, until the cheese is melted and bubbly. 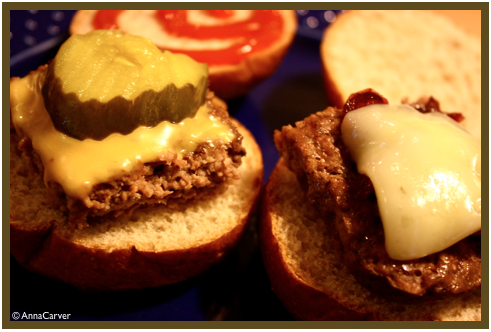 Cut the meat into 24 little sliders and serve on mini slider buns!